Break lo mein noodles into thirds. Cook as directed on package. Rinse with cold water; drain. Cook edamame as directed on bag; drain. 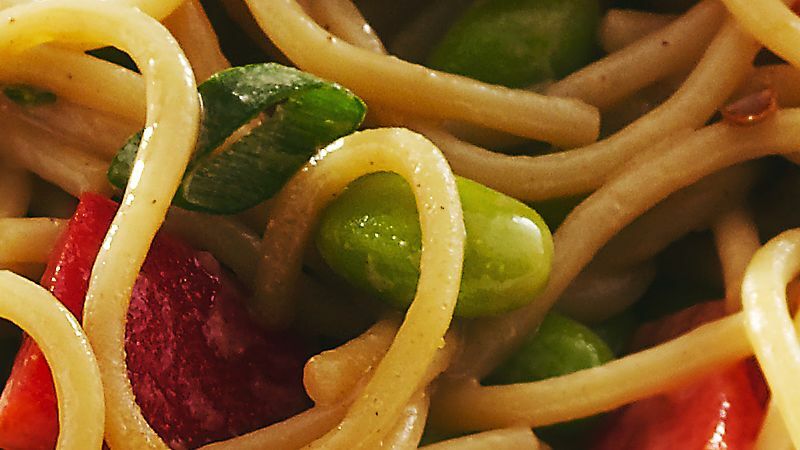 In medium bowl, place bell pepper, onions, noodles and edamame. In small bowl, beat dressing ingredients with wire whisk until well blended. Spoon over noodle mixture; toss to coat. Serve immediately, or cover and refrigerate until serving time. Use 1 to 2 tablespoons chopped fresh cilantro as a garnish. Shelled edamame are sometimes called "mukimame."